Bleached Mulberry Paper is a versatile paper used for many art applications like Shoji Screens, Sumi-e and Block Printing. It is lightly translucent and has been smoothed so that it can easily run through a laser or inkjet printer. 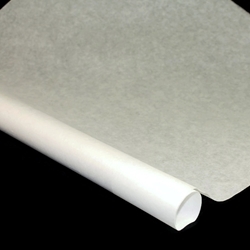 This fine printmaking paper is a staple for any artist's paper collection. Made in Thailand from 100% kozo (mulberry) fiber, the paper is thin yet very strong. Smooth on one side and lightly textured on the other with no sizing, Bleached Mulberry is ideal for any application from block printing to invitations and also makes a great Shoji Screen. Other applications include photograph printing, water color and sumi painting.